The Noble Comb01274 585770work RestaurantThe Noble Comb is a "Hungry Horse" Establishment. The pub offers unrivalled value with a menu and drinks range bursting with choice and flavour for you to enjoy. Have fun and fill up on good times! The Noble Comb is a "Hungry Horse" Establishment. 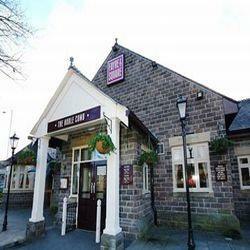 The pub offers unrivalled value with a menu and drinks range bursting with choice and flavour for you to enjoy.